Broken after being cast out by his mentor / foster-father / master, Hugh D’Ambray barely lives. However, when his loyal men, the Iron Dogs, come to him with stories of how they are being hunted down and picked off, Hugh finds a spark of life and reason to live. First on his agenda, finding food and shelter for his men. Knowing he may have to sell what’s left of his soul to find security isn’t going to stop Hugh. Elara Harper is the leader of a group of cast-off witches and magic users looking to protect her home from potential invasion. So when Hugh offers an alliance through marriage, the pair says, “I do,” before the ink dries on their agreement. Now Hugh and Elara must survive each other in order to protect their people. Iron and Magic is the highly anticipated first book in the Kate Daniels spin-off series, Iron Covenant. Although the book works as a starting point for new-comers to the Kate Daniels world, it is going to be much more rewarding for long-time Kate fans. Additionally, there are a few key events that will have repercussions on the upcoming (and final) Kate Daniels book, Magic Triumphs (August, 2018), making this a must-read for fans of the series. Overall, I enjoyed the book and loved learning more about Kate’s long-time nemesis, Hugh. When we first met him, Hugh D’Ambray was a power-hungry maniac who did whatever it takes to finish his job. He was cast aside by Roland, stripped of Roland’s love and power, leaving a huge, painful void within Hugh. Over the course of Iron and Magic, we see Hugh from his own point-of-view, adapting and adjusting to the vacancy created by Roland’s absence. Hugh is not a nice man, and his stripes don’t change all of a sudden (now that he’s the “hero”). In fact, we continue to see his cut-throat nature; however, his focus is now protecting his people, rather than following Roland’s orders. Many of Hugh’s more notable past actions are examined through a new lens, giving readers a different perspective of Hugh. Elara is Hugh’s perfect match. She has her own secrets and is held apart as a monstrosity. Her number one goal is the protection of her people, and like Hugh, she’ll do what is necessary to make it happen. The pair banter and play, twisting and twining around each other until they form a cohesive and strong bond. We have much to learn about Elara’s true nature, which was only hinted at in this first title. One small issue with the story is that the first half of the book is slow, making it difficult to fully immerse myself in the story for a while. As an avid Kate Daniels reader, there is a bit of repetitive world building that isn’t needed for those who read Kate, but necessary for newcomers. It makes it hard to get into the story until the action and plot picks up about midway into the book. There is a lot of humor and action, with my favorite parts all found the in the last quarter of the book. In the end, I found Iron and Magic an entertaining read and promising start to the Iron Covenant series. The book is a complete story, with a few unanswered questions in the overall plot. I look forward to see how Hugh and Elara are woven into the upcoming Magic Triumphs, and what happens to the pair as the series moves ahead. 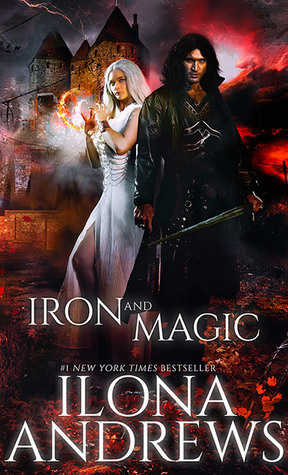 Sign into Goodreads to see if any of your friends have read Iron and Magic.